Ariella Kimmel shows how Human Rights Watch, one of the worlds largest human rights organizations, got the "Arab Spring" wrong. Ariella Kimmel writes on womens rights in the Middle East since the Arab Spring, and the failure of NGOs. 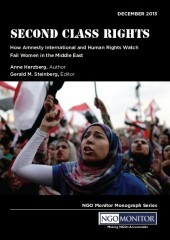 Looking at Egypt as a case study, she argues that human rights groups, such as HRW, have failed the women of the region, who have remained marginalized following the revolution. Kony 2012: IHL 2.0: Is There a Role for Social Media in Monitoring and Enforcement? Communications Director Jason Edelstein argues that politicized NGO agendas have played a role in limiting the impact of the Arab Springs.